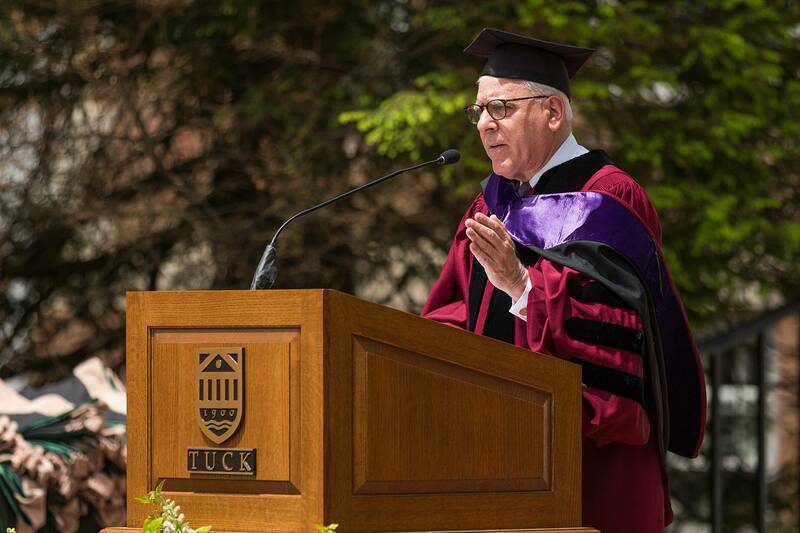 Tuck School of Business | David Rubenstein Tells Tuck Grads, “Don’t Take ‘No’ For An Answer"
Rubenstein, co-founder of The Carlyle Group, one of the largest private equity firms in the world, spoke at the 2018 Tuck School Investiture ceremony on Saturday, June 9. 288 degrees were conferred during Saturday’s Investiture ceremony. David Rubenstein believes a little experimentation goes a long way. Prior to co-founding The Carlyle Group, one of the world’s biggest and most successful private equity firms, Rubenstein embarked on a number of different endeavors. He practiced law in New York City and in Washington, DC. Inspired by President John F. Kennedy, Rubenstein also had a thriving career in government, working as a domestic policy advisor to President Jimmy Carter. 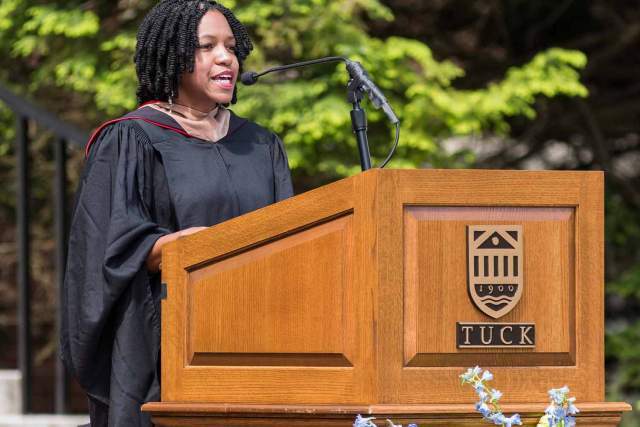 In his remarks at the Tuck 2018 Investiture ceremony, Rubenstein touted the value of trial and error and said it was normal to try out a number of different careers after graduation. Until you find something that you actually love, you won’t be good at it. Nobody ever won a Nobel Prize doing something they hated. Try many different things and experiment. Sharing both inspirational and humorous stories from his personal and professional history, Rubenstein advised the class of 2018 to develop a thick skin like many of the great entrepreneurs, including Amazon’s Jeff Bezos, Microsoft’s Bill Gates, and Facebook’s Mark Zuckerberg. All three, Rubenstein said, were told their ideas weren’t going to work, but that didn’t stop them. In his advice to the class of 2018, Rubenstein summarized the most important traits that he believed all successful leaders embody. He noted that they can stay intensely focused. They’re also great oral and written communicators who have mastered the art of persuasion. Above all, he said, they are curious, voracious readers (of books, especially), and humble team players who act with the utmost integrity. They never cut an ethical corner. You’ll be told ‘no’ many, many times. Perseverance will get you where you want to be. Don’t take no for an answer so readily. A noted philanthropist and the son of a U.S. postal worker who came from modest beginnings, Rubenstein has donated much of his wealth to charity, creating profound change across the arts, in addition to health care and education. He was one of the earliest signers of the Giving Pledge campaign, which was created by Bill and Melinda Gates and Warren Buffett to encourage philanthropic giving from the world’s wealthiest individuals. Giving back, Rubenstein said, has been one of the most valuable ways he’s been able to provide meaning to his life. In 1987, Rubenstein co-founded The Carlyle Group, which currently has $174 billion under management in 31 offices across the globe. He currently serves as the chairman of the Kennedy Center for the Performing Arts, chairman of the Smithsonian Institution, and as president of the Economic Club of Washington, DC. He earned his undergraduate degree from Duke University in 1970 and a law degree from the University of Chicago, where he served as editor of The Law Review. In 2018, he was also awarded an honorary degree from Dartmouth College. The 117th Tuck Investiture ceremony took place on Saturday, June 10 in front of Tuck Hall, where 283 MBA degrees were awarded to members of the class of 2017. 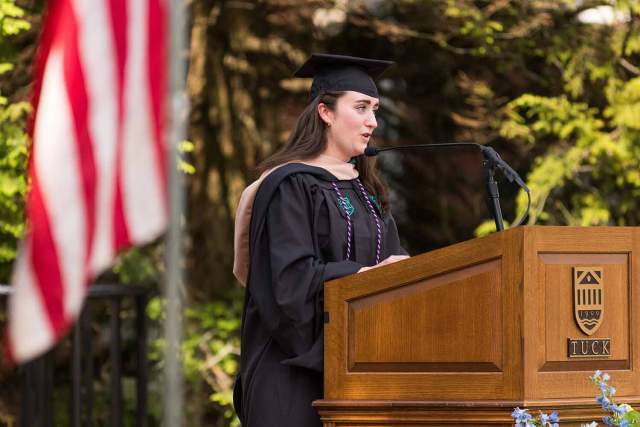 Courtney Miller T’17, a former officer in the U.S. Army, was selected to deliver the class address at this year’s Investiture ceremony.